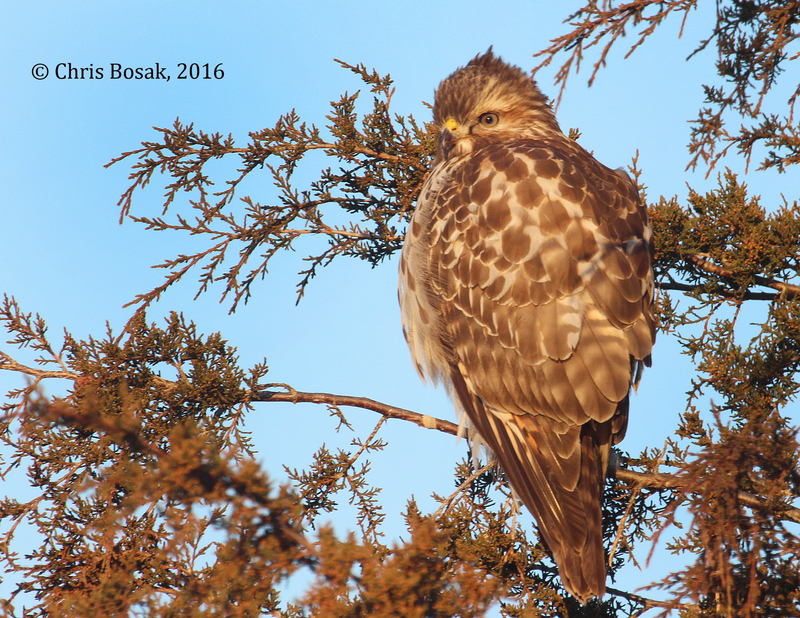 A Red-tailed Hawk perches in an evergreen in Brookfield, Conn., winter 2016. I know it’s not your traditional Christmas greeting photo with a Northern Cardinal sitting on an evergreen bough as snow covers the background. But whoever said I follow the rules all the time? I got these photos the other day while driving through Brookfield, Conn., as the sun was rising for the day. 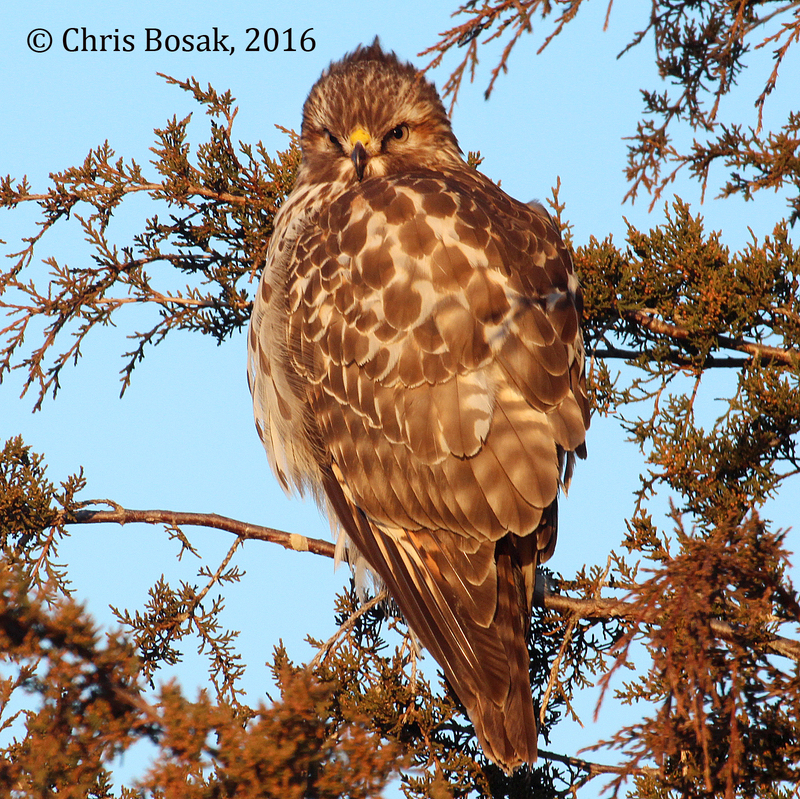 The scene was awash in the golden light of the dawn and the Red-tailed Hawk stood out clear as day on the dark green evergreen. Merry Christmas and happy holiday to those who view and enjoy http://www.BirdsofNewEngland.com. Thanks for your support! 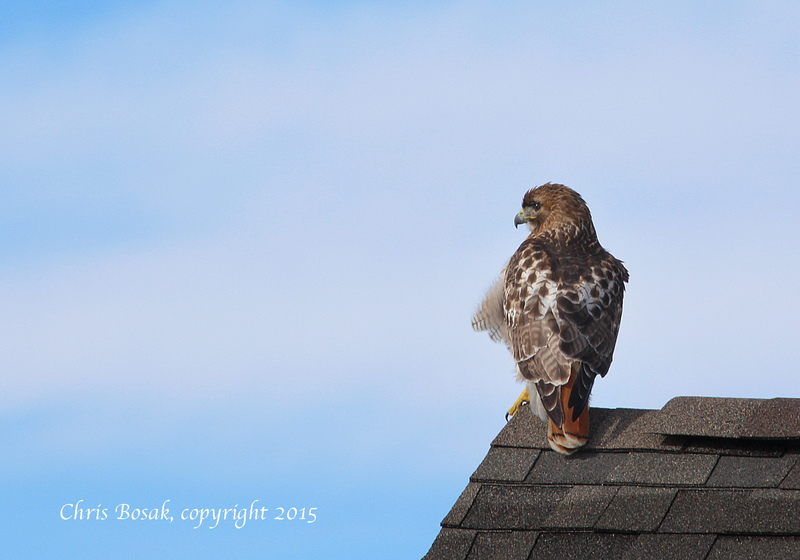 I know I wrote in my first post about the Red-tailed Hawk that it would be a two-parter. I couldn’t resist, however, throwing this one up on the site, too. It’s a hawk’s world. 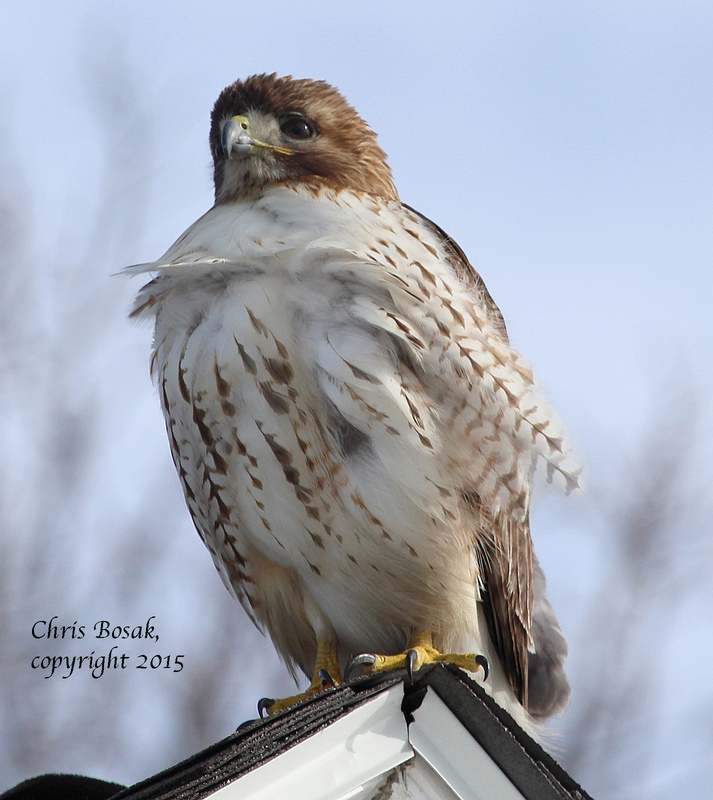 A Red-tailed Hawk at Weed Beach in Darien, Conn., Jan. 2015. 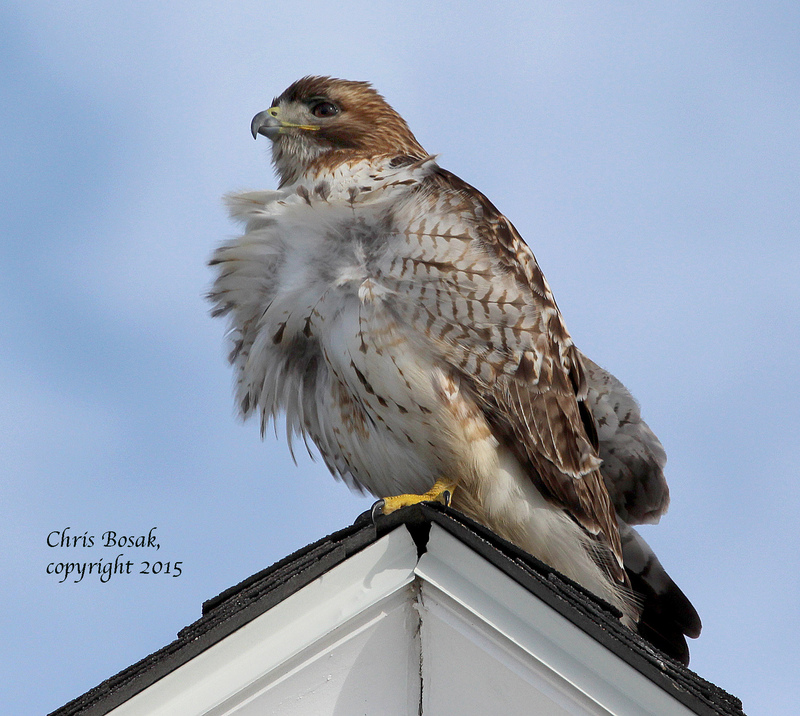 Here’s the first of a two-part post about a Red-tailed Hawk I found at Weed Beach in Darien, Conn., last week. These photos will show the hawk with gusts of wind blowing its plumage. I was focused on a tree near the beach that had a White-breasted Nuthatch and a Downy Woodpecker in it. I thought I was getting good shots of the nuthatch, but when I checked the screen on my camera, the results were always subpar. I wasn’t sure what I was doing wrong, but I just wasn’t nailing it. Then I looked in an adjacent tree and spotted a much larger subject. Since I had been in that spot for several minutes, the hawk clearly did not mind that I was there. 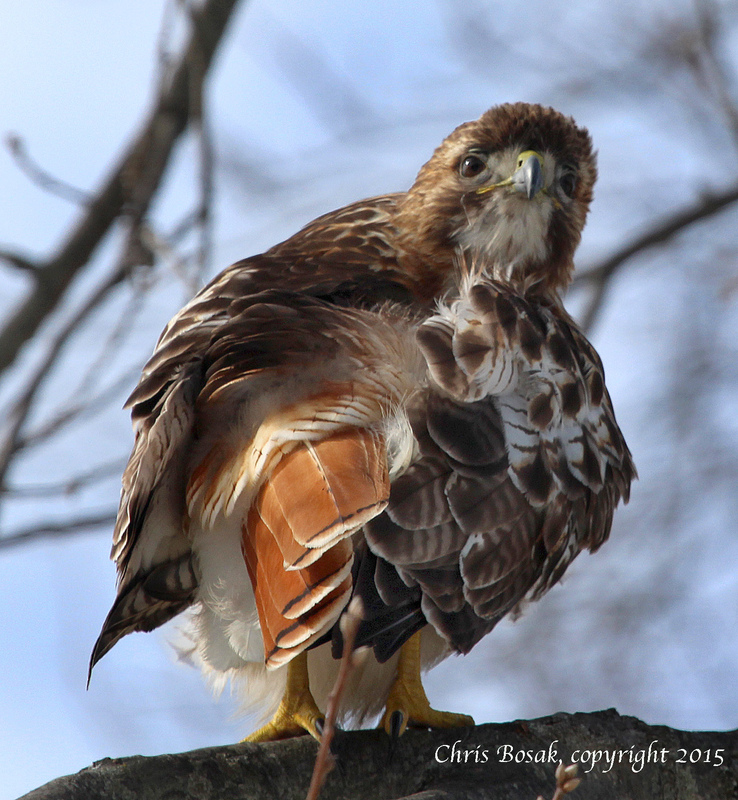 I gave up on the nuthatch and turned my attention toward the Red-tailed hawk. I took several photos of the hawk in the tree and it eventually flew to a nearby structure where I was able to get a few more shots as the hawk seemingly watched a foursome play paddle tennis. The wind was whipping pretty good that day, making for some interesting shots of the hawk. The next posting (coming in the next day or two) will show the hawk under calmer conditions. 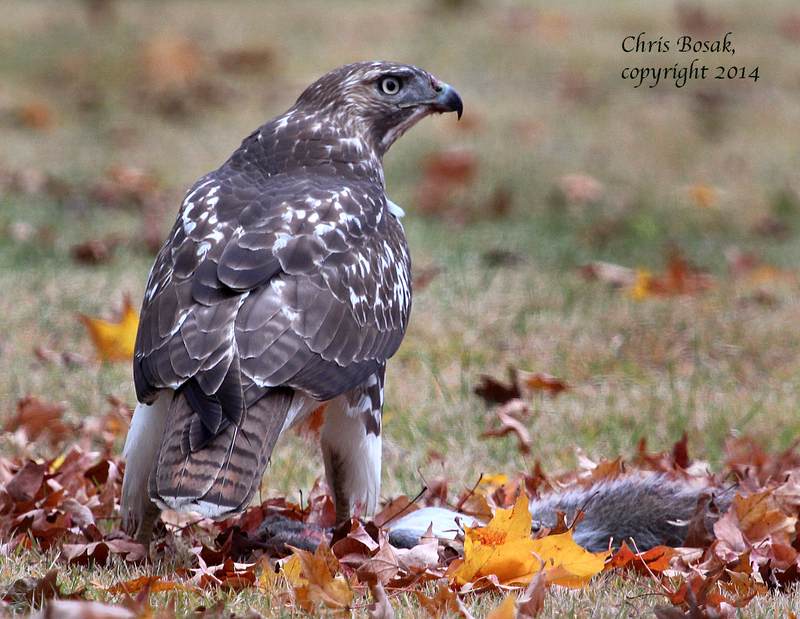 A Red-tailed Hawk eats a Gray Squirrel in a cemetery in Darien, Oct. 2014. A local cemetery is often fruitful when it comes to finding birds. This day was no exception as literally hundreds of juncos and other small sparrows scattered as I drove slowly along the narrow roads. I almost missed the highlight of the short birding trip, though. 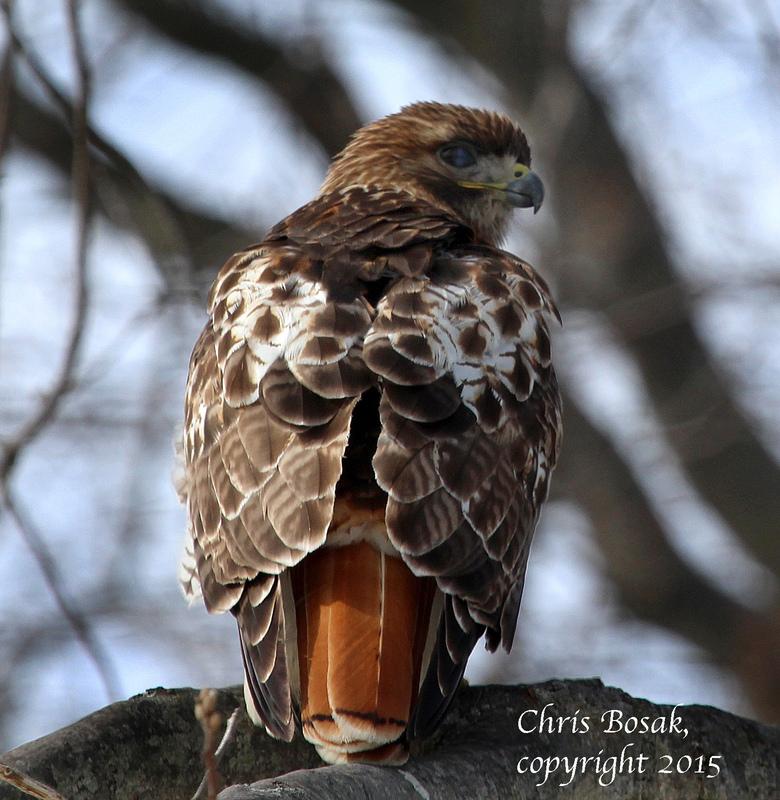 I glanced to my right just in time to see a Red-tailed Hawk on the ground a few dozen yards away. I hit the brakes and backed up just a touch. 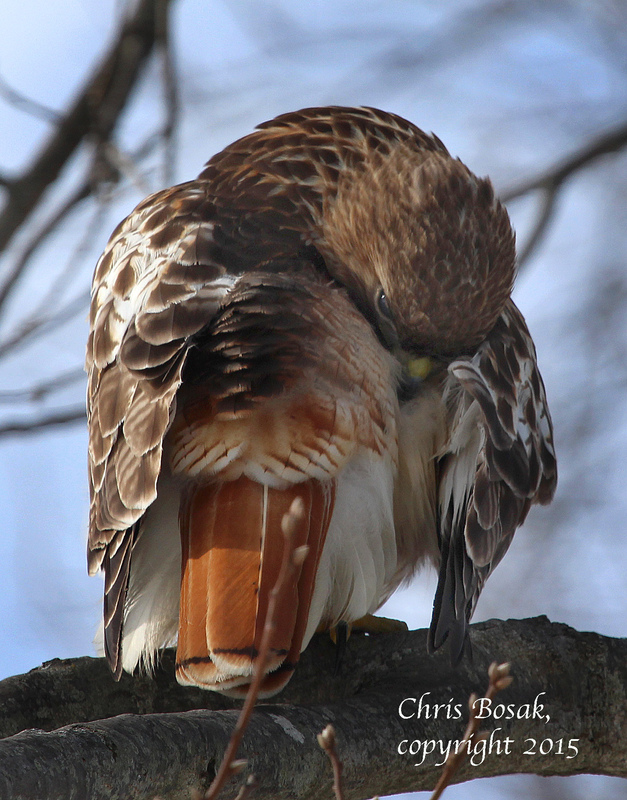 A Red-tailed Hawk on the ground usually means it is eating. Such was the case as this raptor was picking apart a freshly-killed Gray Squirrel. I watched for a bit, snapped a few photos and left the hawk to its meal. They aren’t called birds of prey for nothing. 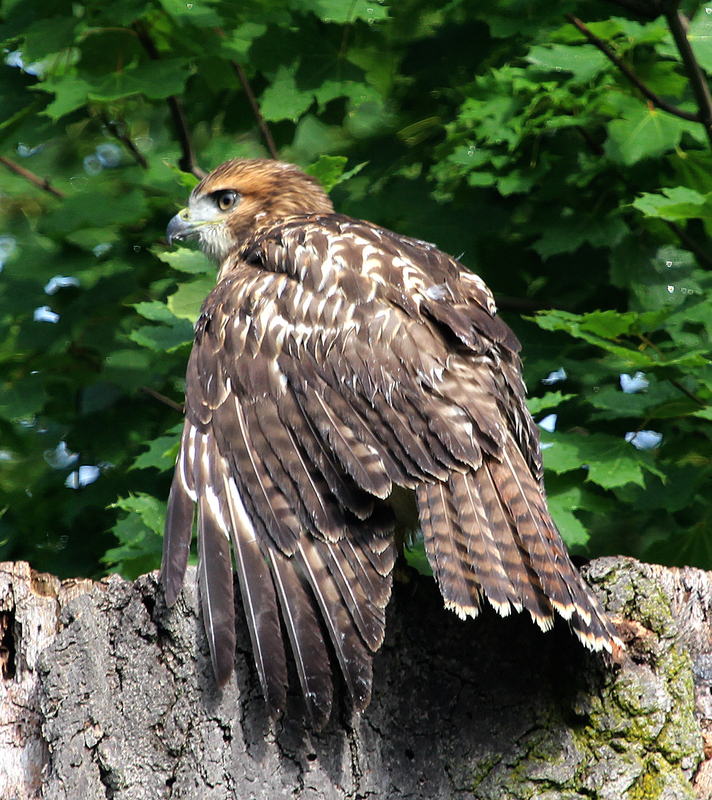 A Red-tailed Hawk perches on the top of a tree in Stamford, Conn., July 2014. 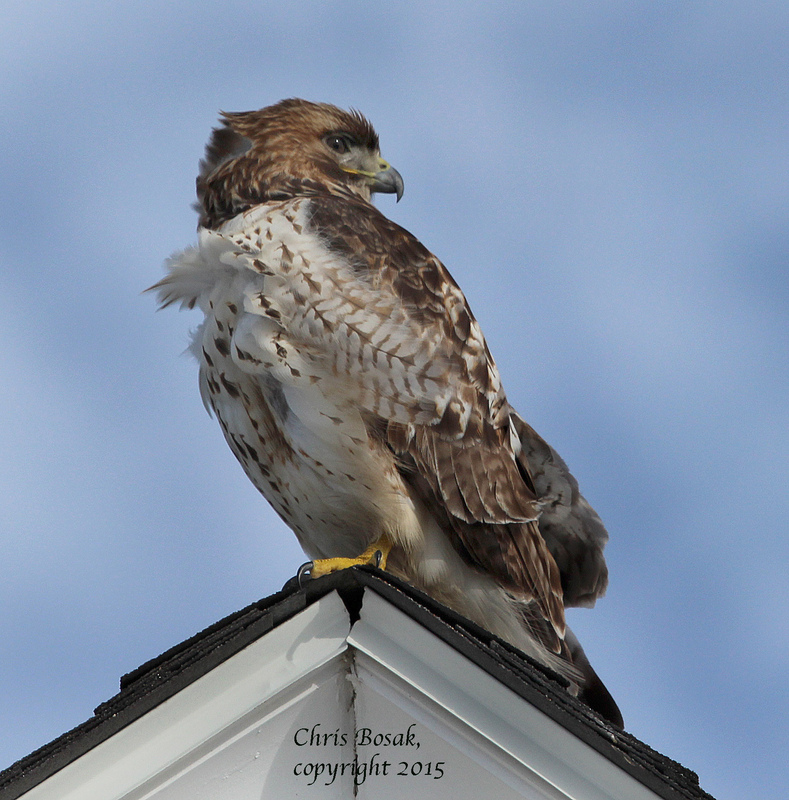 This Red-tailed Hawk perched in the backyard during a recent steamy day in southern New England. I like the way it is showing its feathers while perched on the top of a recently cut-down tree.